In the winter months around the Serrania, you really won’t need to go very far to see more Paper White Narcissus than you could ever dream of. Around Ronda and the Pueblos Blancos – the white villages – you won’t even need to get off the beaten track. 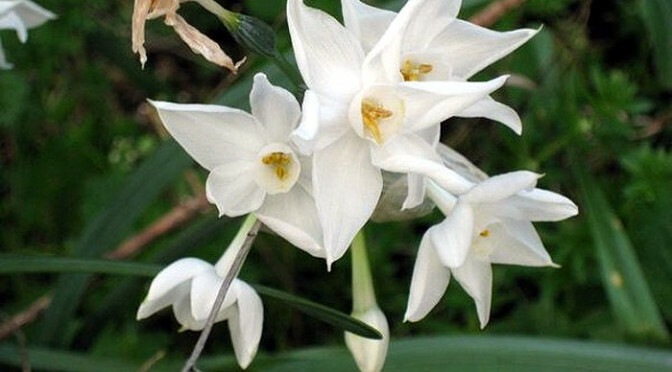 This scented flower blooms in December through to February while the weather is cool, and if March and April are wet and cold they may stay in flower. 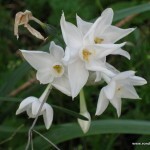 The Paper White Narcissus responds well to indirect light (and temperatures of 10 – 18 degrees celsius), and my own observation is that individuals may do well in full sun or exposed areas, but I generally see prettier clumps protected beside olive trees, or beside buildings. 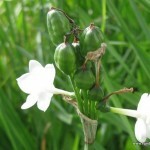 Description: It is a perennial, bulbous species up to 60 cm (24 inches). The leaves are erect and longer than the scape. Stalk greenish-blue, almost flat in cross section, supporting between 3 and 20 flowers in umbels. The flowers are white and fragrant. The corona is also white. It blooms during the winter. Up to around 1000 m altitude (3280 feet). Its curious common name in Castilian “fox pee” possibly refers to the smell of the flowers. Most species of the genus Narcissus contain alkaloids that will give these species a greater or lesser degree of toxicity. 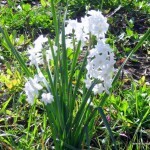 Some species of this genus used in gardening can produce contact dermatitis in sensitive people who handle the flowers and / or bulbs without adequate protection. After the flower has died, a green pea will remain on the end of the stem. Nombre científico: Narcissus papyraceus Ker Gawl.